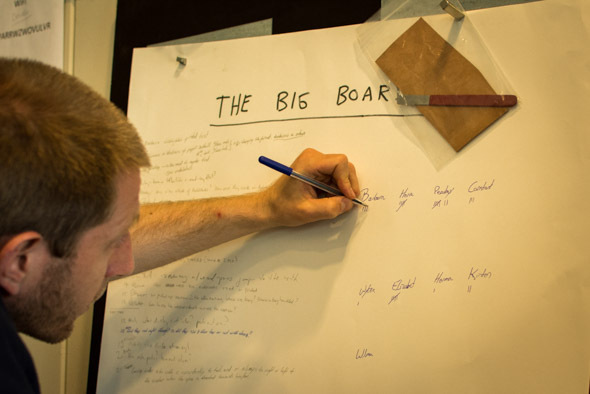 The Scratches Don’t Lie and The Big Board: Impressions from Teaching in the Netherlands. 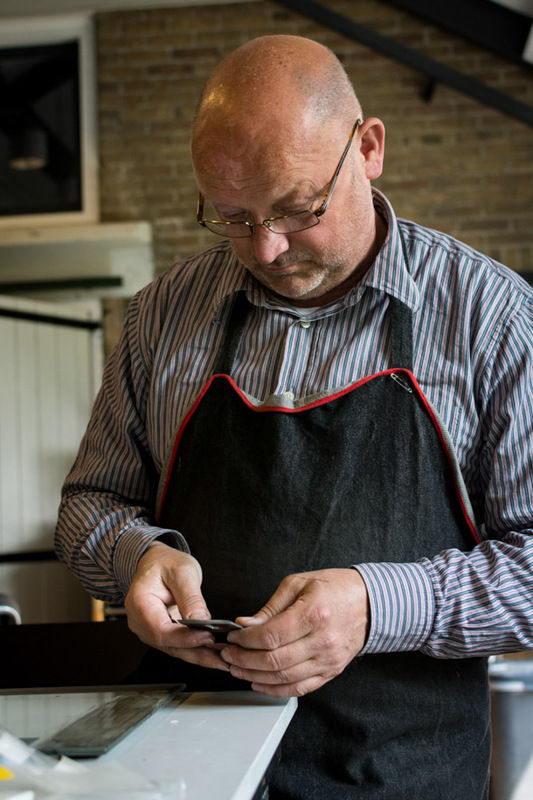 Earlier this summer, I spent a couple of throughly enjoyable weeks in the Netherlands, teaching two workshops through the auspices of Restauratoren Nederland, at the beautiful bindery of Wytze Fopma in Friesland. First there was a 3-day sharpening/ spokeshave modification class, a wadlopen and tour of Mennonite sites, then a 5-day 18th c. French binding class. It was all very, very good. Each time I teach, I keep adding current research. I’ve taught versions of the sharpening class over thirty times, and the French at least a dozen. It sounds cliche, but I do learn something new each time. This class, Constant Lem, book conservator at Koninklijke Bibliotheek, convinced me of the importance of the 180 degree shoulder that the French bindings often have. I’d considered and worked on this, however working together we made progress on this historically unique(?) structural feature. 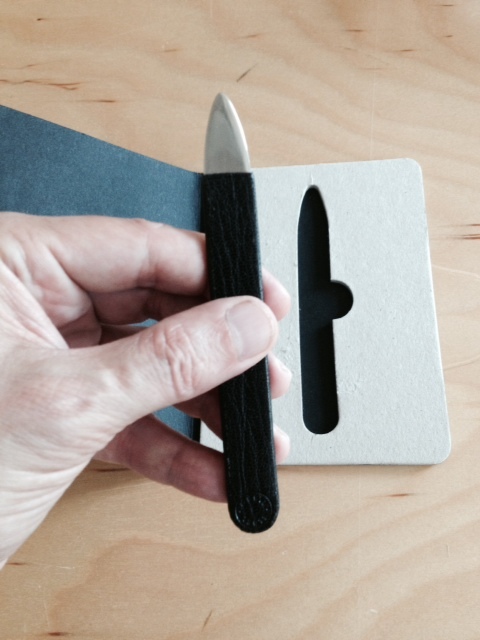 The steel folder, which Ben Elbel calls “score!”. Before the workshop, I visited Ben Elbel, of Elbel Libro, in Amsterdam. He has a large studio, is doing some very nice work, and has a board beveling machine that I plan to steal at some point. Ben gave me a nifty steel folder which he sells. It is a nice size for detailed work, fitting comfortably in the hand, well made, and is also useful for blind lines. It comes in an attractive die cut storage folder. Metal folders keep popping up every now and then in the history of bookbinding: the earliest I’ve seen was patented in 1889. 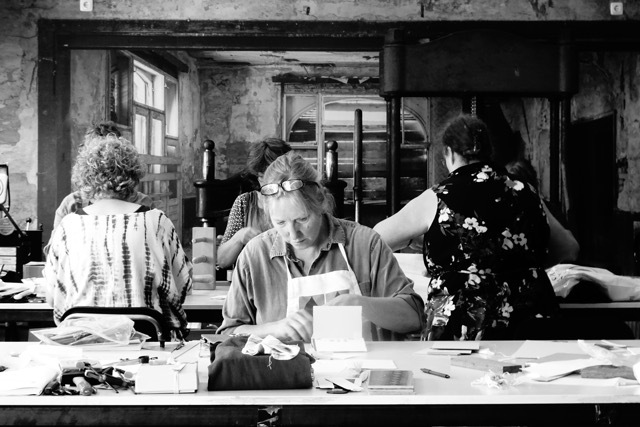 Below are images from the workshop. One of the most important aspects in freehand sharpening involves looking at reflections and scratch patterns in the blade, in order to understand what you are doing and what needs to be done. The visual feedback lets you know how to alter your hand pressure or technique. The scratches don’t lie. The Big Board is a learning tool I use in the French class to keep track of questions, deviations from historic practice, instructor mistakes, material differences, etc. Whoever has the most observations wins a prize, in this case a small lifting knife. Often there are over 150 observations. This helps keep us aware of inaccuracies generalized from our modern craft training that can creep into the historic style we are trying to understand. 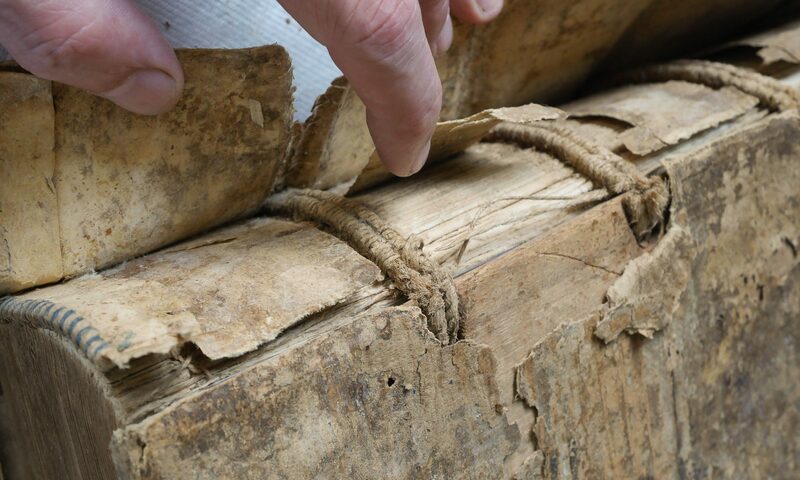 As invasive treatments continue to become more infrequent in book conservation, the type of knowledge gained from making historic models will help keep book conservators relevant (I hope! ), by increasing our knowledge of how these books were originally made. Conservation as interpretation? 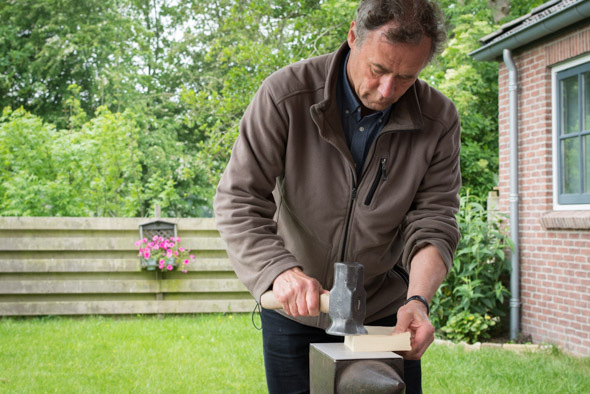 Not only did we have a custom made beating hammer, but we borrowed an anvil from the Blacksmith. A wonderfully solid substitute for a beating stone! Wytze’s large standing press. He said it took nine people to tilt it back upright after it was brought in through the door. A huge blocking press is on the left. 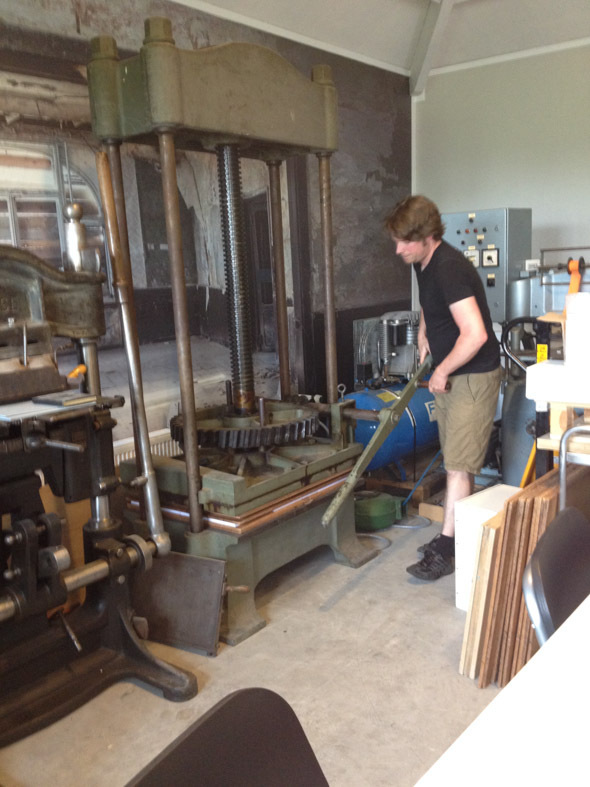 Come to think of it, EVERYTHING in the bindery was super heavy duty. My photo. Wytze has the most massive operational standing press I’ve ever seen. He mentioned that it is the largest in Holland. He is operating the worm drive. Once the center screw is tightened as much as possible, to generate even more pressure, the drive can crank the main press screw another turn or so. The drive can be easily disengaged to quickly raise or lower the press. As a demonstration, he pressed some of our textblock paper so hard it sunk into the MDF pressing boards, creating a clamshell. It had little to do with the class, but was too impressive not to mention. On the left is an 18th century skull the Wytze found, the finished books, an 18th century (?) French (Dutch?) beating hammer on the right, and in the back, the printed handouts for the workshop bound en-broche by Wytze and Herre. We started with the same tan calfskin; the color variations on the finished books resulted from varying applications of glair, paste wash, and warm burnishing. These are powerful and inert ways to control the color and surface sheen of leather without dyeing. The skull and beating hammer literally and symbolically bookend this workshop: we were working with the head and the hand, using theory and praxis, to learn more about the nature of 18th c. French binding. 180 degree shoulder = no shoulder or backed on itself? These books are often backed so that the endsheet is adhered 2-3mm on the exterior face of the boards. At first I though it was an accident, but many, many books have this. I coined the term “180 degree shoulder” but am open to suggestions for something better. Thoughts? So great to hear about your observations and teaching experiences. Thanks! Just out of curiosity, any sign of spine straps on books at the Mennonite sites? I didn’t get a chance to see a lot of Mennonite books, just a couple of Martyr’s Mirrors, and they had plain spines, though one had a chammois second covering before it was restored. That Big Board is a genius idea – what a great way to keep track of a workshop, the deviations from historic practice in particular. Love that! Previous PostPrevious Neolithic Knife Sharpening Stone?